Providing marketing, social media, public relations, & logistical support to authors, artists, non-profits, and entreprenuers. 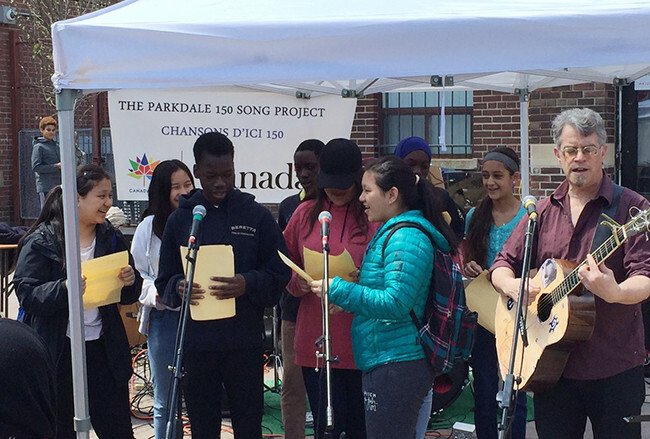 Throughout 2017, students attending schools in Toronto’s Parkdale neighbourhood wrote songs for the Parkdale Canada 150 Song Project. EmmKay Media provided PR and social media support to the project. CityNews Toronto attended one of the final rehearsal before a 30-minute concert featuring Grade 7/8 students from Parkdale Junior & Senior PS and Fern PS, and Grade 5/6 students from Queen Victoria PS. The students showcased songs created in a Canada150 Fund-supported project facilitated by Juno-nominated and Queen’s Diamond Jubilee Medal awarded singer-songwriter Mike Ford (Prologue to the Performing Arts). The diverse learner-created songs explore and celebrate local and national stories with lyrics in English, French, Tibetan, Tamil, Hungarian, Spanish, Mandinka, Tagalog, Arabic and Cree. The songs are melodic and lyrical results of inquiry into themes ranging from immigration experience to local food choices; from 1812 battles to The Halifax Explosion; from Prohibition tales of the last century to the modern-day fight for clean drinking water. Workshop days were conducted at each of the three host schools through the Fall months. In these sessions, Mike Ford kicked off the project with interactive introductory concerts of his original Canadian history-themed repertoire, showing examples of different approaches, methods and song styles that can be used as vehicle for artistic inquiry. These concerts were then followed by song workshops that allowed learners to play with concepts of brainstorming, song structure, rhyme, rhythm, and more. From there, song themes were chosen, and the songwriting groups dove in to creating their own original compositions. Listen to finished songs on the Parkdale 150 website. 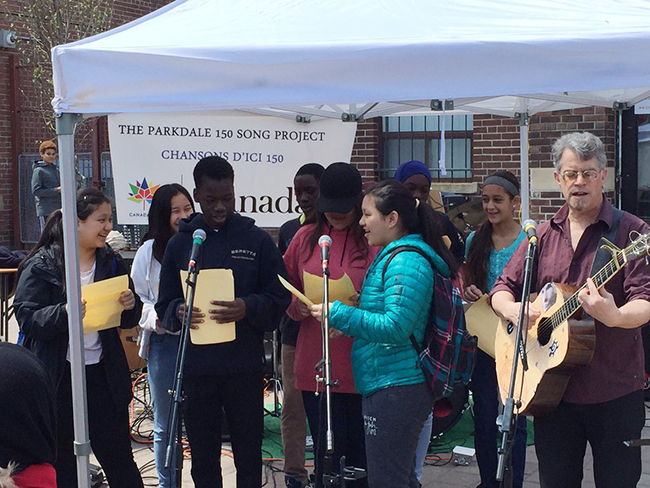 The Parkdale Canada 150 Song Project / Chansons d’ici 150 was made possible by The Canada 150 Fund of the Department of Canadian Heritage / Patrimoine canadien. Copyright © 2019 EmmKay Media. All Rights Reserved.